We are pleased to announce that you can now easily launch your Nagios XI monitoring server easily in the Amazon Elastic Compute Cloud (EC2). We have available clean centOS 6 with Nagios XI pre-installed available for public and customer use. This makes it extremely easy for Nagios XI Administrators to start additional server without the need to procure or invest in hardware. Additionally, those wishing to demo Nagios XI can easily do so using the cloud. This document describes how to launch a new pre-installed Nagios XI server in the Amazon EC2 cloud and is intended for Nagios XI Administrators who would like to bring up new Nagios XI instances in the Amazon Elastic Compute Cloud (EC2) as well as those who are moving existing installations to the cloud. 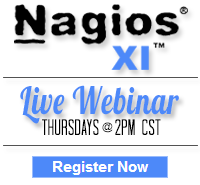 Start a trial copy of Nagios XI in the cloud! If you are new to Nagios XI, or would like to see it in action, this would be a fast and efficient way to give it a test run. Category: Cool Stuff, Nagios XI and Uncategorized. 17 Comments Tags: amazon, aws, cloud, demo, ec2, monitoring, nagios, trial, XI.